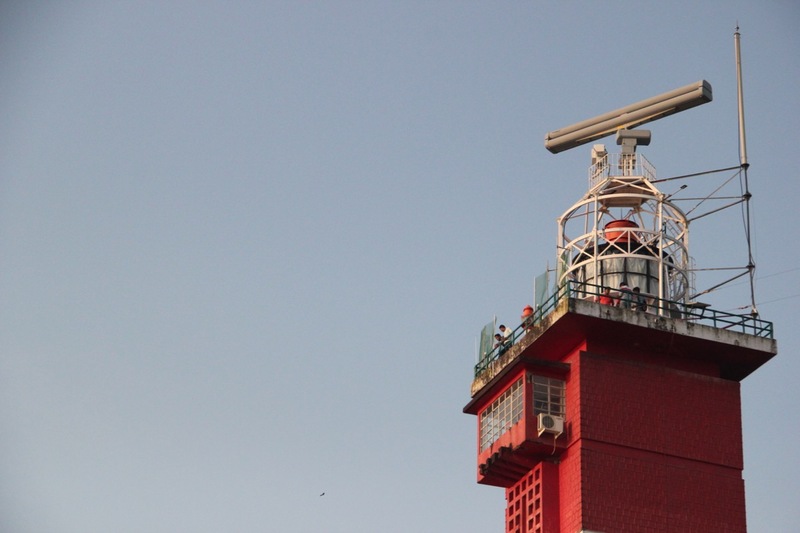 A trip to Mangalore after a long time is no less than an overdose of nostalgia. Events and memories that were hidden for a longtime in remote regions of subconscious bounce back. This time it had been more than 6 months since my previous visit. I had four days in hand and that seemed perfect to make up for all the loses. I had no agenda, like I never do when I visit home. Because the home itself is the destination I long for. 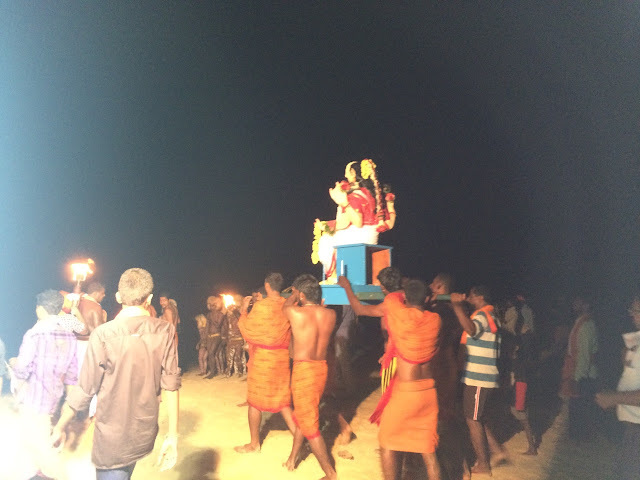 The farm, the beaches and during Dasera, Yakshagana performances in the neighbouring temples keep me engaged. 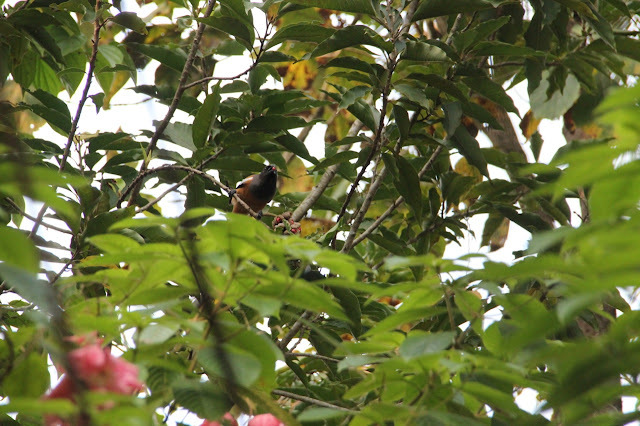 And of course those regular visitors to the house. On Thursday (Oct22), the day I arrived, I visited a neighbour and relative for a get together lunch. 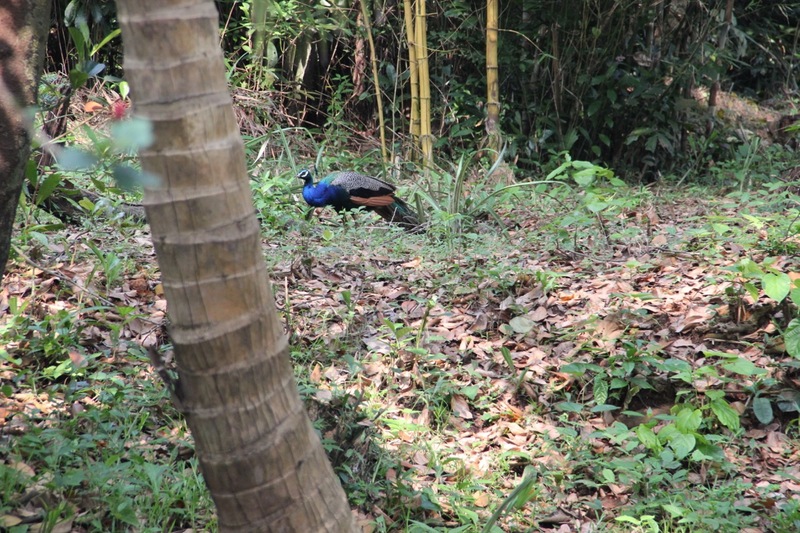 I got to meet a few relatives after long time. 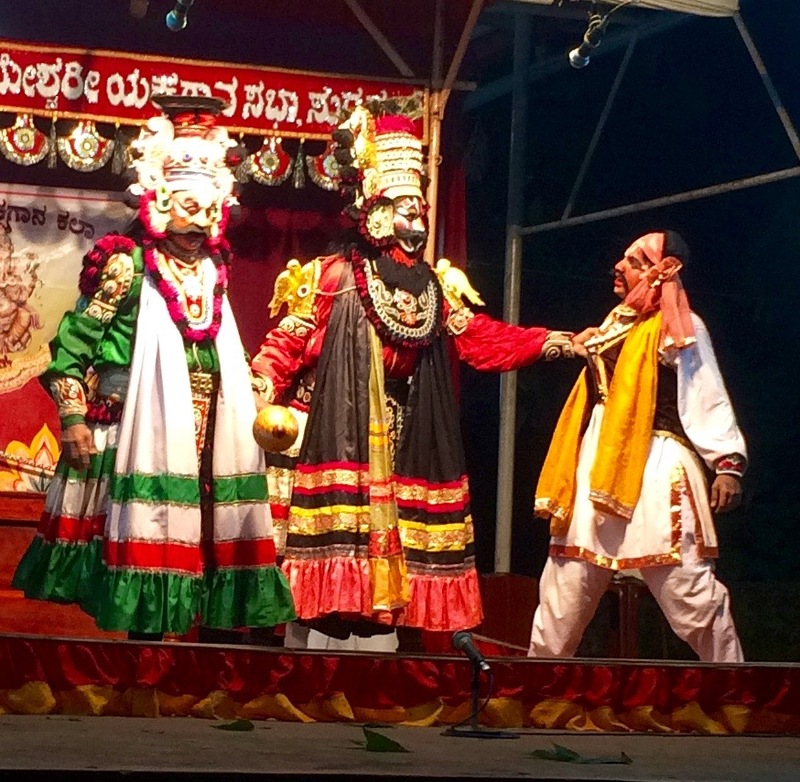 In the evening, I watched a Yakshagana at one of the Mariguddis (Temple of goddess Mariamma) near my house. It was not very impressive, so I left midway. On Friday (Oct23), I mostly relaxed at home. Went shopping in Surathkal and saw the old buildings still there adjacent to the new ones coming up. Not much has changed though here, I noticed. 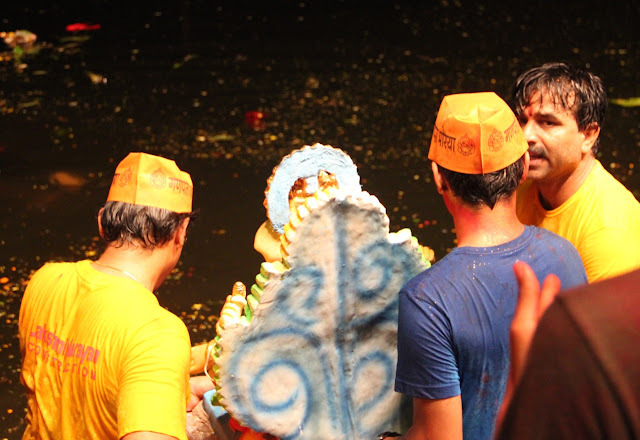 In the night, I decided to watch the visarjan of Sharada idol. Something I have not done in these many years. I walked to the beach at around 11:00 PM and waited for the procession to arrive and watching a few boys busy making an idol of a goddess with sand. 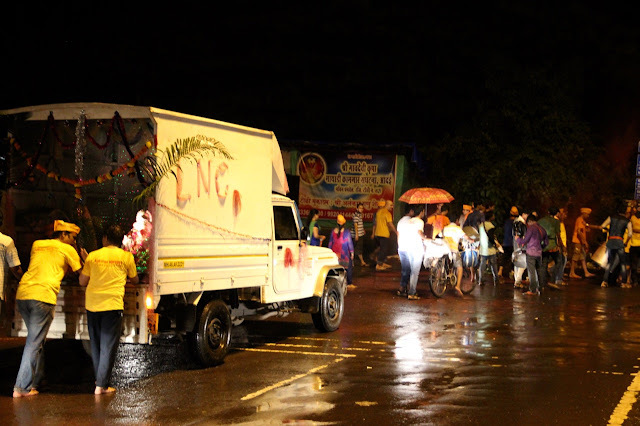 The procession finally arrived at 2:30 AM. A Tiger dance troop came tired and sat next to me. Their body paint had almost left their skin. Due to the itching the rest of the paint slowly but unintentionally began to scrap away. In a water bottle they had filled some local liquor and they passed it to one another for a sip as they discussed their issues. How much they are paid and how some of their friends had denied participating out of ego and things like that which would make up for a good script for a writer sitting beside them. 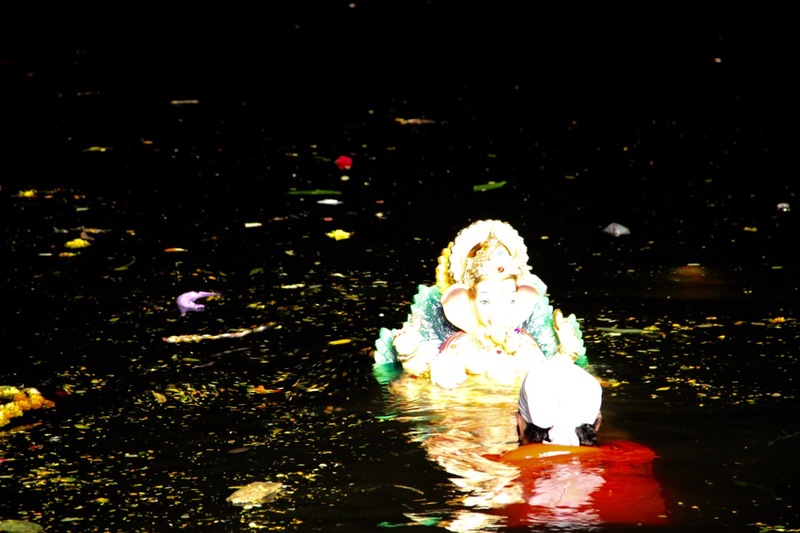 After the Sharada idol was worshiped one last time the jewellery and flowers were removed and the idol was taken to the sea. 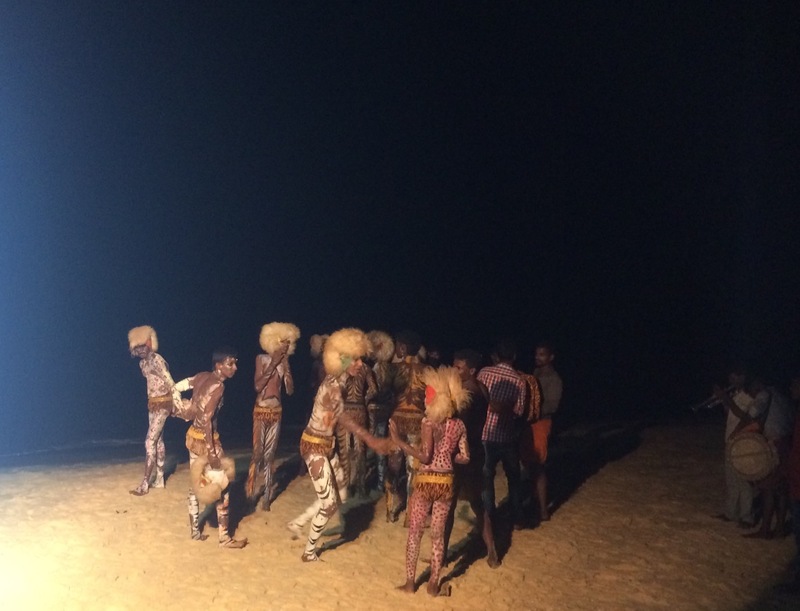 The tiger dance troupe danced for one last time. With her she is believed to have taken all the bad omen that might affect a city. 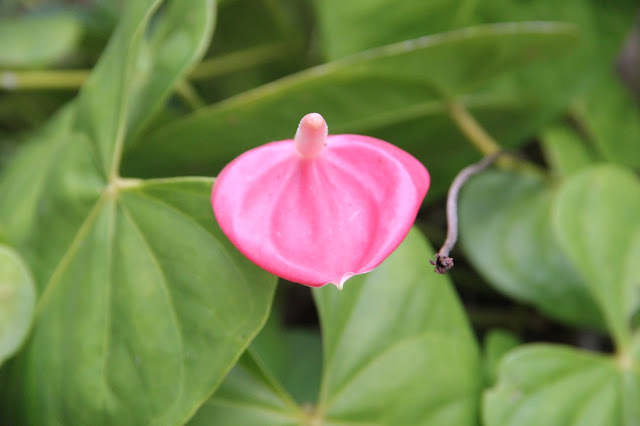 At around 3AM, I returned satisfied of having observed an event. On Saturday (Oct24), I took a morning walk by the beach and met my colleagues Sandeep and Pavitra who were in our friend Sadiq’s taxi. It was a mere coincidence. I invited them home for lunch. Later that evening I took another walk by the beach and returned home enriched by the empowering sound of waves that always fill me with zeal for life. On Sunday (Oct 25), I attending my colleague Arun’s wedding and met Pradyumn, Rohit, Gautam and Anvesh there. After lunch, we had some ice-cream for desserts at Pabbas and then we headed to my house. We went to the lighthouse, had maggie oh sorry Yippee at the shack near by and then the boys enjoyed playing in the beach. They left by 7 and I took my bus back to Bangalore by 9:30 PM. 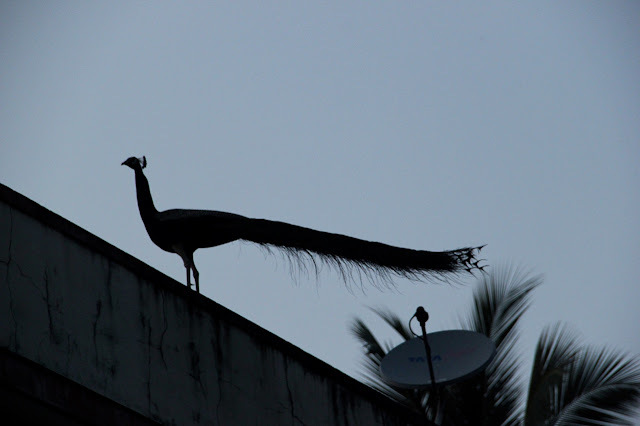 A trip to Mangalore is filled with experiences and stories. I learnt about the three tiger dancers who refused to participate in the event as they were not paid enough. I got to know about Daniel who is happy if the family members of the dead live abroad as he makes money out of refrigerating the deceased until their family arrives. 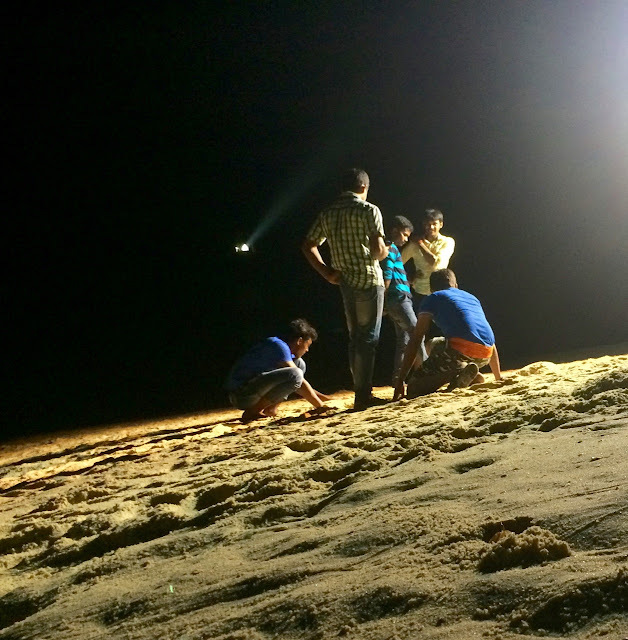 Three boys from Bangalore had recently walked to the rock in the sea and when one of them got washed away, the other two had no guts to return back and called for help. Post a theft at my house a week ago, someone my mother knew wanted to sell roll gold jewellery to her as she had read in the newspaper that even those were stolen. Such interesting stories can happen only in Mangalore. 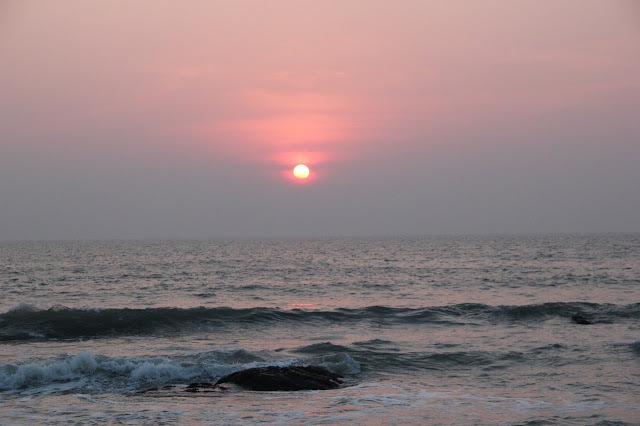 Every trip to Surathkal is one closer to nature, culture and tradition. Modernisation is definitely influencing the entire country but here, in Surathkal, it seems to happen in a slower pace. For now it has reached the animals. No, these two movies have nothing in common but just that I recently watched them and wish to capture my experience in a single post. 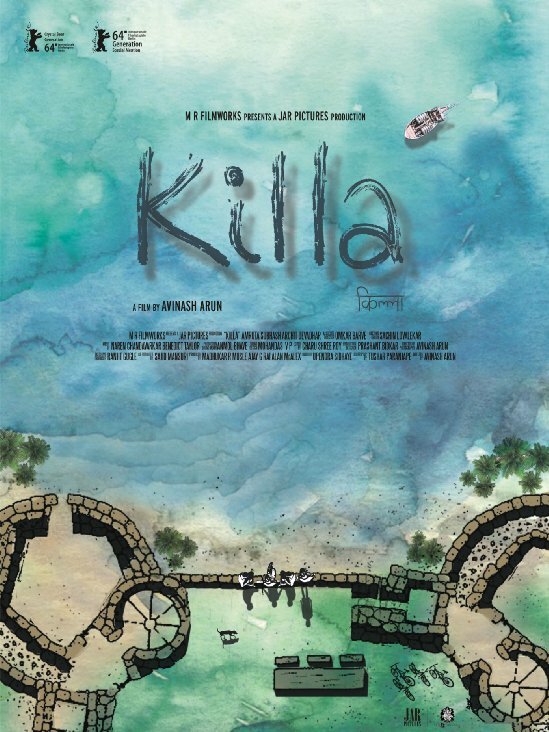 "Killa" (Fort) is a coming of age film in Marathi language shot entirely in the Konkan region of Maharastra. The storyline is nothing new. The plot and character of the main protagonist resemble those of « Le gamin au vélo » or « Extremely loud and incredibly close » but for indian audience this is definitely a new territory. The story revolves around a boy who has moved from the city of Pune to a much smaller town in the Konkan and he fails to adapt and refuses to come out of the sorrow of his fathers death. Basically the stories conveys how the child has shut himself inside a fort and does not let anybody in. But the Konkan atmosphere and surrounding is bound to change him. I was also able to see another subtle meaning in this plot. 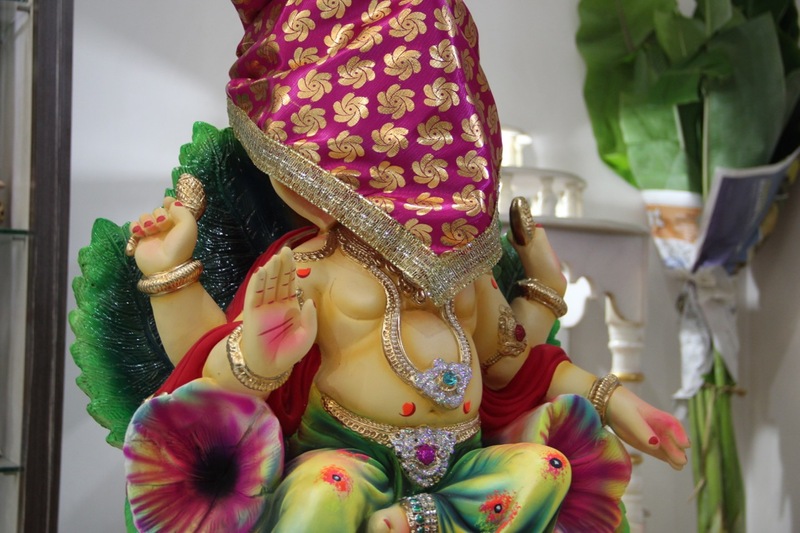 The child is a Brahmin. He could have been of any caste but the author chose him to be of an upper caste. Being a Brahmin myself, I can relate to the story of adapting and accepting beyond ones religion and caste that has heavy influence on the indian society. In the far Konkan land, the child learns that there is a beautiful world out there and he cannot shut himself in without accepting that fact or befriending the people around him and by overcoming his grief he has to look beyond. Great cinematography compliments the incredible performances by the main characters. I must thank Ganesh bhai for suggesting me this movie. Cloud atlas, the book is a masterpiece. The movie deviates a little from the book and tries to drive its own conclusions from the story. Some of it makes sense, some of it further complicates the story than it is already. 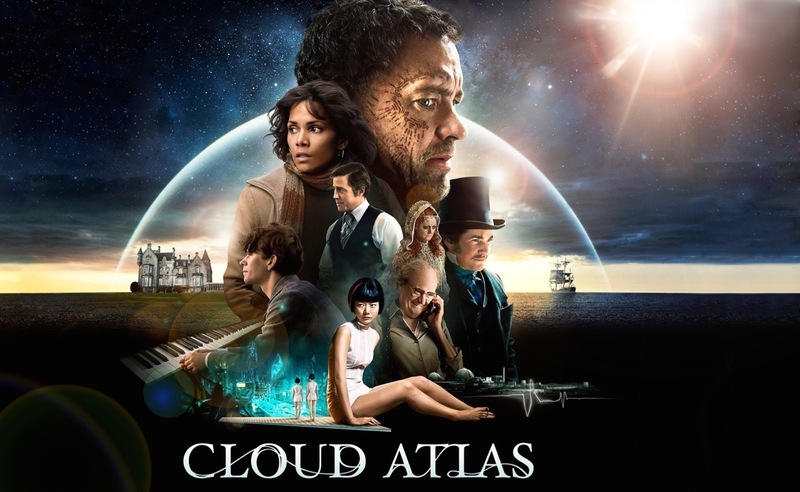 Cloud Atlas is a collection of six stories that are all connected. The first story is set in 1849 in the pacific island where a lawyer is sailing back from Cathay islands to San Francisco and suffers a severe illness during his journey. He recounts his experiences in his diary. The second one is about a bisexual English composer who in 1931 travels to Bruges to work as amanuensis to an ageing composer. His story is delivered through the letters he writes to his lover. In the third story, set in San Francisco of 1973, Luisa ray, a journalist gets involved in a very messy affair dealing with safety of a nuclear reactor. In the fourth segment that happens in London of 2012, an old publisher is facing an ordeal from which he must escape. In 2144, a fabricant cloned for slave labour from Neo Seoul is helped to escape by a rebel group and is tasked with a mission to begin a revolution. In the final story that takes place in a post-apocolyptic society (2321) somewhere in Hawai, world has gone back to a primitive state. Zarchy, a tribe helps a much advanced human from other part of the world in her mission. Now all the main characters in these stories have a birthmark that resembles a comet thus connecting them. Are they the same soul taking re-births to bring a revolution of a kind against the wrong in every era? Are we repeatedly making the same mistakes? Do souls evolve and transform from one birth to another? Several of these questions to be pondered upon while watching this movie. I leave without disclosing any interpretations as every viewer may drive his own connection between these stories. But even if this movie is to be watched as six separate stories, it is a treat to watch. Post my trekking, I indulged myself in the preparations for the Ganesha festival that Mumbai was gearing up for. Our friend Ganesh Bhai, had the background art for the Ganesha idol all planned. 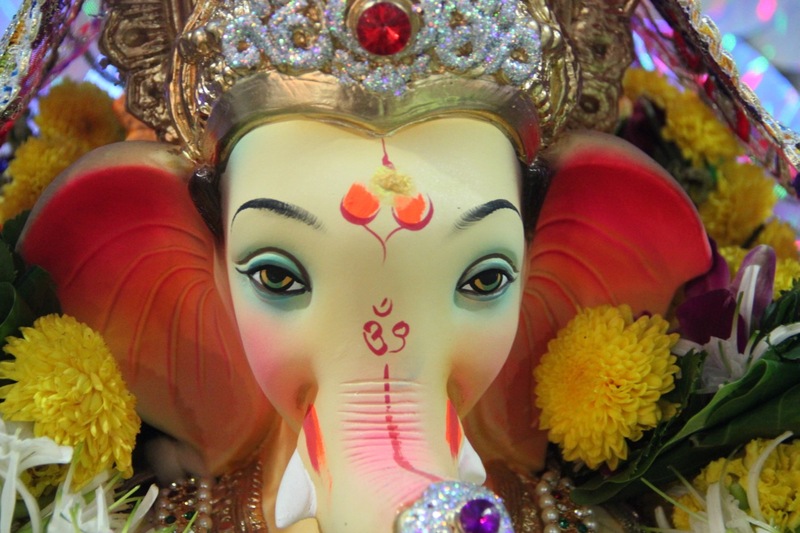 He had two ideas, one for the apartment Ganesha and the other to be arranged at a friend's house. 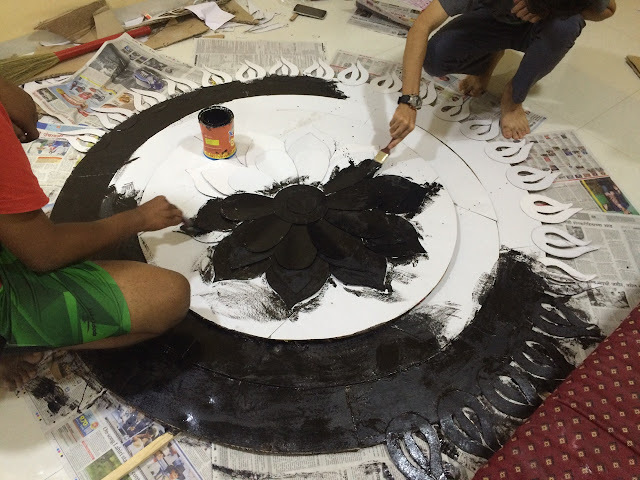 I was lucky to be part of this because, I learnt a lot about a new form of art. 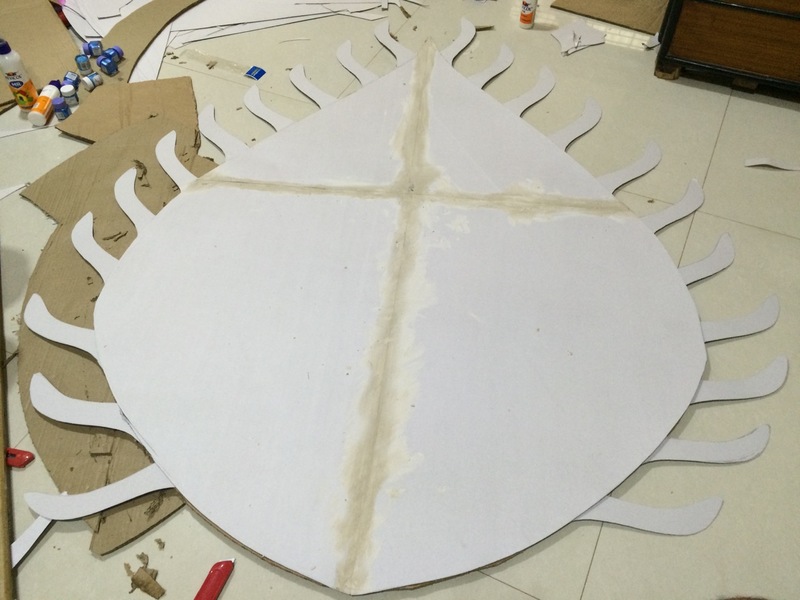 Cardboards were cut in different shapes to form the outline. They were then joined and stuck to a hardboard that came from box material. 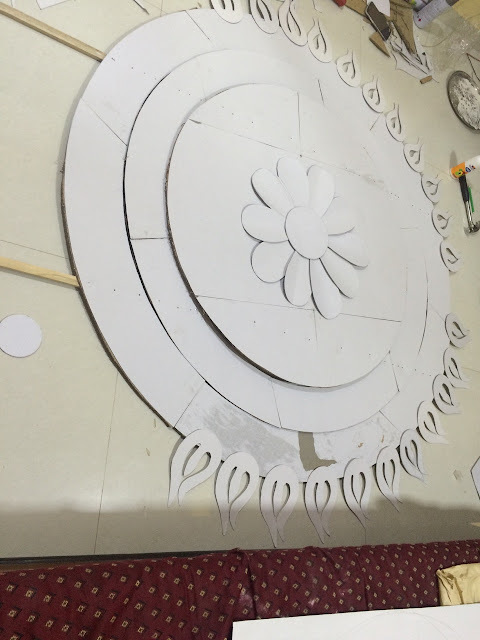 On one of the works, we tried plaster of paris to fill the gaps in the work but it did not stick well. On the other, we planned a 3-D effect by providing wooden strips between layers and stuck together all the minute details of the final art. A black primer was applied before the silver spray paint went on them. 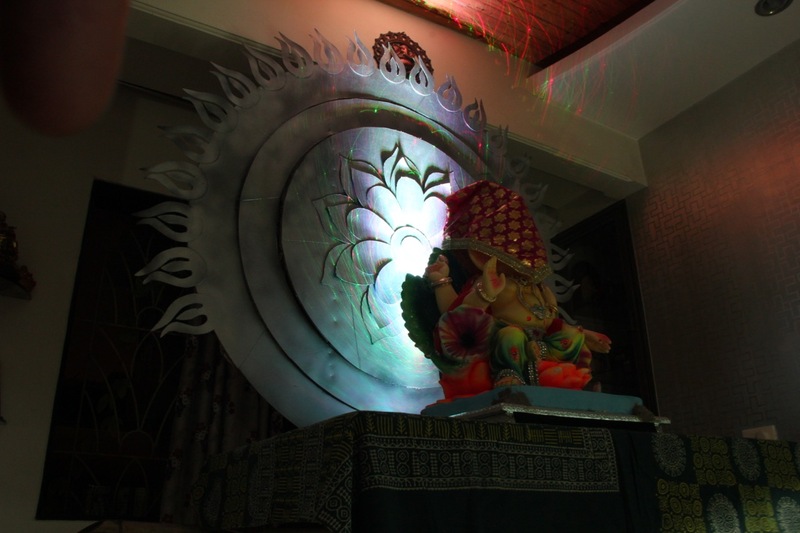 But it was the idol of Ganesha and some lighting that made this art work complete. By the time the first one was complete it was 11:30 in the night. We had to get to the second one. 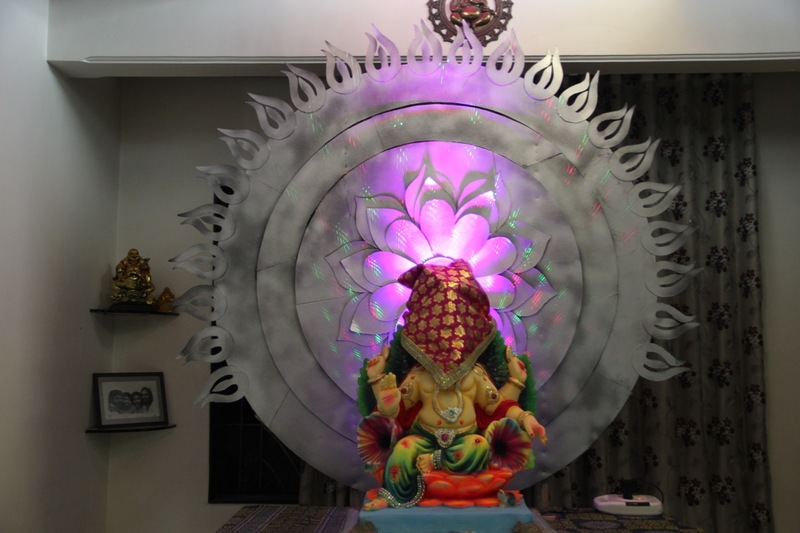 For the one to be placed downstairs, Ganesh Bhai had originally planned colours like blue and orange to resemble a peacock feather but the black primer ruined the plan and we could not apply colours on them. So we went with gold and silver spray on that too. 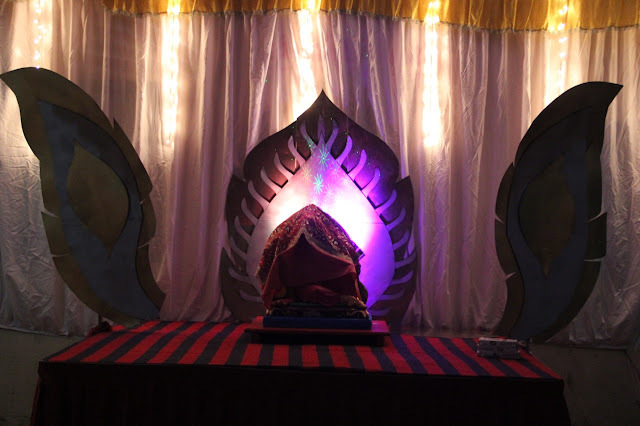 Again the lighting and the Ganesha idol completed this work at 6:00 AM on the morning of Ganesha festival. A full night was thus spent in doing some good and interesting art work. The joy that the process of doing an art work is unmatchable and this time it was a collective work from me, my Brother in law Dinesh, Ganesh Bhai and his son Shivam. 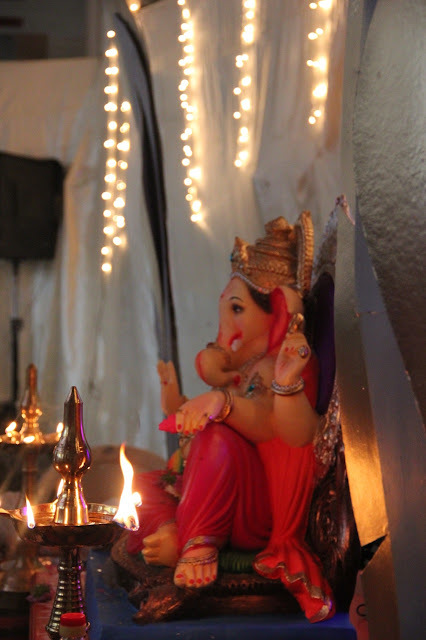 Next morning at around 10 or 11, we all got together for the Ganesha pooja. 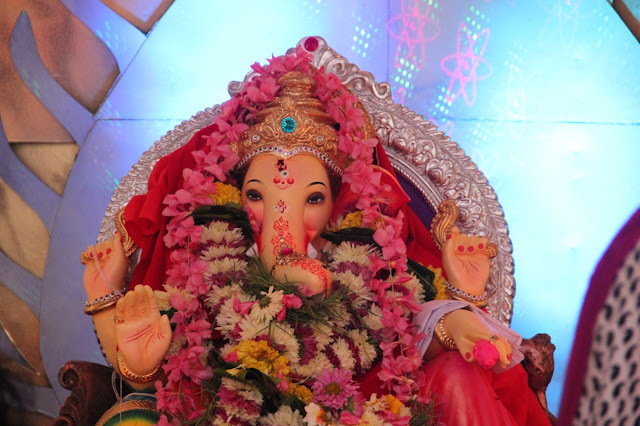 It is always nice to observe the enthusiasm in the Mumbaikars during a Ganesha festival. 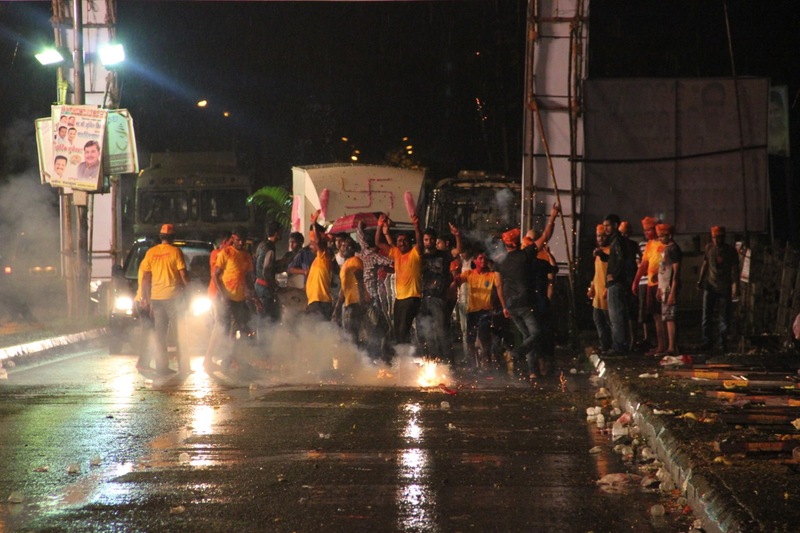 I witnessed the 1.5 days visarjan. As it continued to drizzle, the crowd lovingly and enjoyably danced their way towards the lake and sent away their beloved Ganesha. 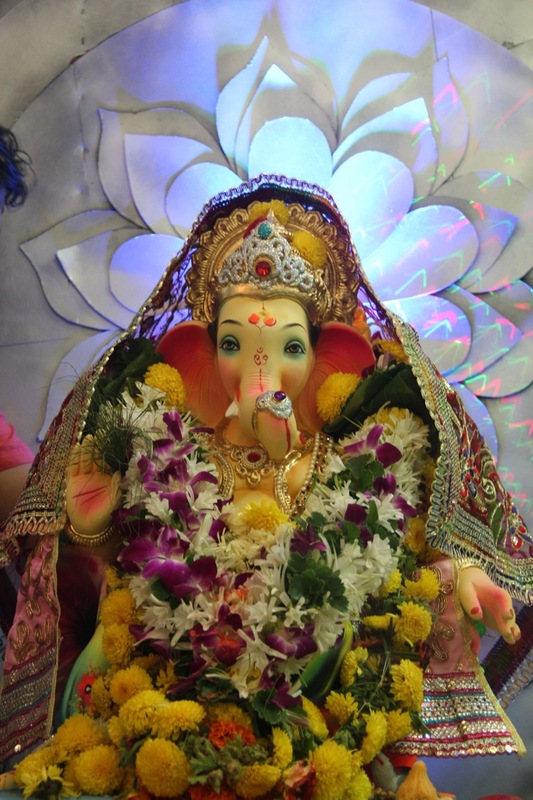 During the Monsoon and Ganesha festival, that luckily coincide, is definitely the best time to be in Mumbai. Apart from that, did make some local train journeys to meet my friends in Mulund and Vashi and my aunt in Kharghar. My sister as usual cooked some delicious Maharashtrian dishes that I like. 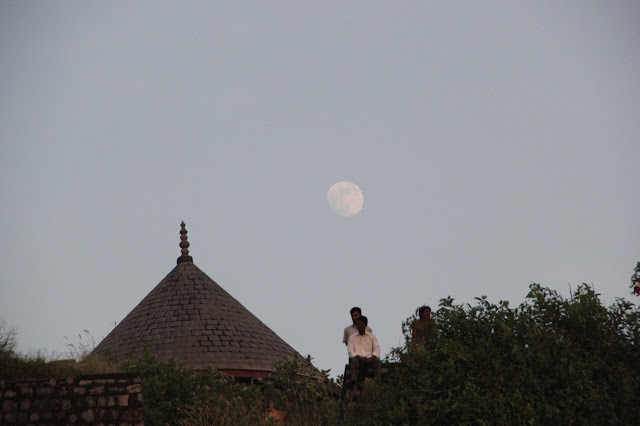 This trip like all previous ones to Mumbai felt complete.